Naidu said the Congress ruled and ruined the country and that is why people have 'neglected' them in the Lok Sabha elections. 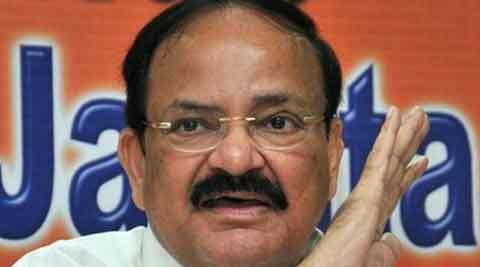 NDA government would not launch witch-hunt against its political opponents including Robert Vadra, but the law would take its own course, Union Parliamentary Affairs Minister Venkaiah Naidu said on Friday. “I don’t want to make any political comment. We don’t want to launch witch-hunt but at the same time the law would take its own course,” Naidu told reporters when asked whether government would take any action against Vadra, who is allegedly involved in controversial land deals. Both Narendra Modi and BJP had made Vadra a major target of their campaign during the Lok Sabha polls and the party had also released a video and booklet on his land deals. Naidu was in the city to attend the BJP’s felicitation of four Union ministers, including him, from Karnataka – Ananth Kumar, D V Sadananda Gowda and Siddeshwara. Replying to a query, Naidu said the Congress ruled and ruined the country and that is why people have “neglected” them in the Lok Sabha elections. “They (Congress) have been misusing power and authority from time to time. They ruled and ruined the country. People have given a clear mandate to us. I hope, they will realise it, behave in a responsible manner,” he said. He said BJP, which had often accused UPA government of giving step-motherly treatment to states ruled by it, will not discriminate against states and would keep intact the true federal spirit of the Indian Constitution. “As far as development is concerned, we do not discriminate on the basis of party ideologies of state governments. Prime Minister Narendra Modi has told all of us that you must take states along with us and work together and keep the true federal spirit of the Constitution in mind and work hard,” he said.